How do I add a Gift Message option to my products? If you 'd like to give your shoppers the option of adding a special Gift Message to be combined and shipped with the product, simply add it as an option type to the product(s). Type in the Option label's name. For example, "Add a Gift Message"
Using the "Type" drop down menu, select the one labeled "Text Area"
Once you've added the Option Label, you will see it listed in the Options Tab. Now, we'll go over the steps involved in setting up the individual option sets - in other words, the actual selections - for that option. In this case, we'll only need one for the shopper's gift message. 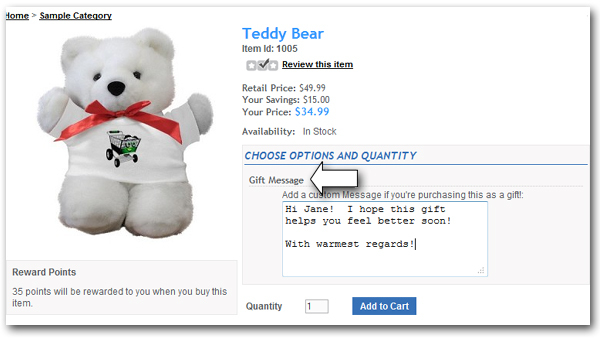 Enter a description for the individual Option such as "Gift Message"
Your product will now include a text box that can be used to add a personalized message as shown below.